T.P. Trailers, Inc. is a family owned business specializing in providing our customers with outstanding service during the purchasing process and after the sale. We have grown since 1946 and are able to provide our customers with increased lines of equipment such as trailers, truck equipment and snow removal equipment. We are your truck and trailer people and we back up our sales with superior service and a knowledgeable parts department. We hope when you come to T.P. Trailers, you find a place that you want to come back to again. We like getting to know our customers and learning their wants and needs so we can provide the best service; that begins with low prices, and it always has—we had no hassle pricing before it was in style! T.P. Trailers, Inc. has grown into a business we are proud to offer to our community, both locally and on the world wide web. We look forward to serving you. 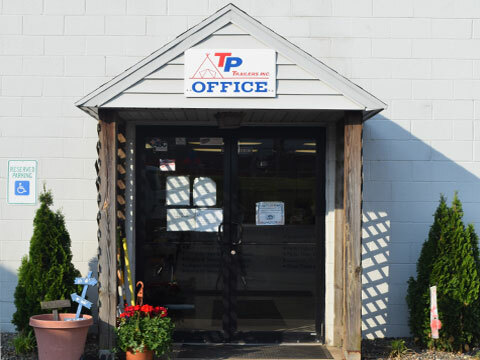 TP Trailers is the place to go for all of your trailer needs. They have awesome trailers as well as awesome people that are always there when you need them. Vintage Lawn Care of Telford, PA is very happy with our new Car Mate 8x16 enclosed trailer and expect to get a lot of good years from it. Lori, Jim and Ed were top notch when it came to customer service as well as everyone else involved in my buying decision. I will be buying all of my trailer needs from TP Trailers from now on. Good, trustworthy companies are hard to find anymore, especially ones with such good customer service like TP Trailers! !